8th Annual Comedy Night | Latest Club News | The Exchange Club of Farmington, Conn.
We hope you are enjoying your Sunday! The Exchange Club of Farmington, Conn.
Gino and his committee put on yet another awesome evening of comedy at The Farmington Club. Over 220 people attended this year, a new record! Phil Chabot put out some great appetizers. Many thanks, Phil. We had 4 comedians this year (5 if you count Gino): Rick Roberts, the time-tested MC (and part-time attorney), Ellen Karis, Angel Rentas and Headliner R.C. Smith. The event was enjoyed by all and made a good profit for the benefit of our charities. Great job, Gino!! There are currently no meetings scheduled. Please check back soon! There are currently no fundraisers scheduled. Please check back soon! There are currently no community events scheduled. Please check back soon! The Exchange Club of Farmington proudly sponsors Boy Scouts of America Troop #68. 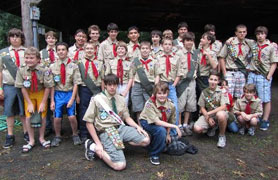 Chartered in 1919, Troop #68 is Farmington's oldest Boy Scout Troop and among the oldest continuously chartered troops in Connecticut. 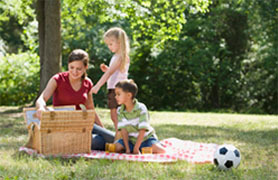 In partnership with the Connecticut District Exchange Clubs, The Parent and Child Center at Bristol Hospital's primary focus is on prevention of child abuse, neglect and family violence by providing support systems. Every May you will find the Exchange Club of Farmington leading the Memoral Day Parade. 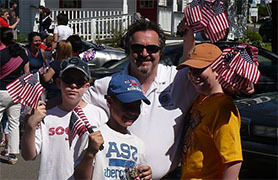 Our club hands out 100s of American Flags to the kids lining the streets of the parade - both to the young and the young at heart!